American researchers claim to have found convincing evidence that locates the site of the lost kingdom of Atlantis off the coast of Cyprus. 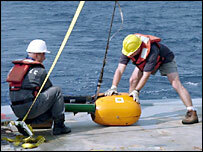 The team spent six days scanning the Mediterranean sea bed between Cyprus and Syria using sonar technology. 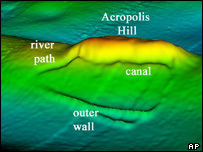 They believe they found evidence of massive, manmade structures beneath the ocean floor, including two straight, 2-km (1.25 mile) long walls on a hill. They say their discoveries match accounts of the city written by Plato. Team leader Robert Sarmast said the walls appear to be sited on a flat-topped hill where the temples of Atlantis once stood. He intends to use the sonar data to make a three-dimensional computer image of the site, 1.5km below sea level, before returning for further research. "The hill, as a whole, basically looks like a walled, hillside territory and this hillside territory matches Plato's description of the Acropolis hill with perfect precision," he said. "Even the dimensions are exactly perfect, so if all these things are coincidental, I mean, we have the world's greatest coincidence going on." However, Mr Sarmast and his team are not alone in believing they have found the lost city of Atlantis. Other researchers have placed it off the coast of Spain, Cuba and the south west of England, as well as under the South China Sea. The story of Atlantis, a fabled utopia destroyed in ancient times, has captured the imagination of scholars ever since it was first described by the philosopher Plato. 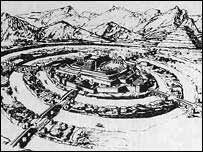 Writing more than 2,000 years ago, he depicted a land of fabulous wealth, advanced civilisation and natural beauty.